Built by the Emperor on 28 B.C. as a burial place for himself, all the members of the Claudian-Julian Family and their familiar servants. Strabo describes the tomb as a large monument in the vicinity of the river, rising on a gigantic sub-structure of marble, richly decorated and having over it a “tumulus” planted with evergreen trees. The whole was surmounted by the statue of the Emperor. The entrance faced the South and was decorated by an imposing vestibulum richly ornamented and having an obelisk on each side; these obelisks were found and are now one opposite the Quirinale Palace (Palazzo Quirinale), the other in Esquilino Square (Piazza dell’Esquilino). The mausoleum was surrounded a wood forming charming avenues of trees which contained the so called Ustrinum or crematory place; scattered round were found inscriptions with names of members of the imperial family and stating that they marked the spot where the bodies were cremated. In the vestibulum stood probably the famous stood probably the famous inscription dictated by the Emperor himself and narrating his deeds; a copy of this inscription was found in the monument of Augustus at Ancyra. Works of investigation and restoration made in the last few years, inside and around the tomb have shown that latter consisted of a colossal edifice of nearly 300 feet in diameter and probably 150 feet in height. The excavation have brought to light also the original sepulchral chamber has recently been reported to the study and admiration of the public. 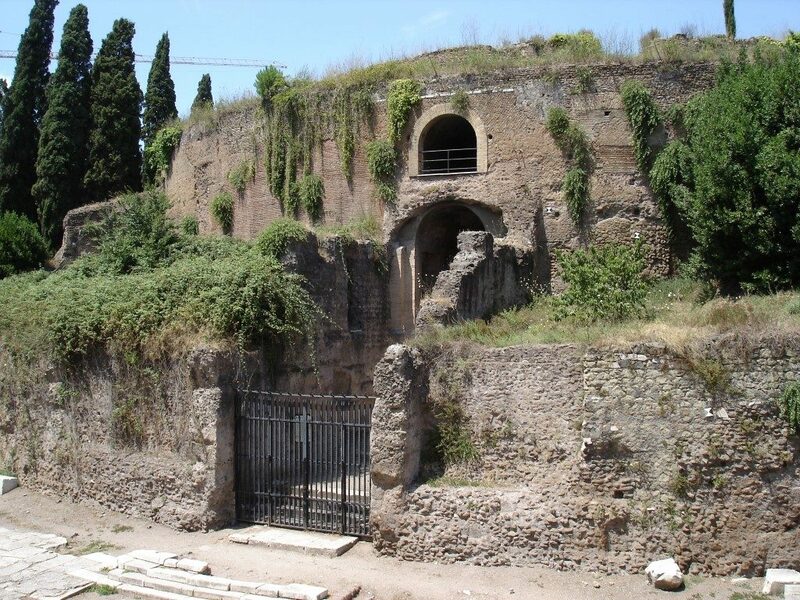 At the entrance on the right may be seen a modern inscription which states: in this Mausoleum by him erected, was buried the Emperor Augustus with his wife Livia, his sister Octavia, his son-in-low Agrippa Domma. Drusus brother of Tiberius with his son Germanicus and her sons together with other personages of the Imperial Family. Inside are visible several inscriptions, some originals and some copies of the originals, now preserved in different museums. May also be seen an inscription of the Tomb of Marcellus and his mother Octavia sister of Augustus. The marble tomb in which the cinerary vase of Octavia stood and the base of the statue of Nerva (the last Emperor buried in the mausoleum ) are still preserved. Official Rome Guide, Rome walking city Tours.